Despite doubts over the usability, wearable devices are expanding their ground in the global market. In particular, smartbands and smartwatches continue to replace conventional watches. According to market tracker Strategy Analytics, the scale of global market for smartwatches and fitness bands is $10 billion won a year and is expected to double in the next four years. Major electronics makers such as Samsung and Apple have continued to invest in this sector to roll out new models. Adding to the top smartwatches such as Samsung's Gear series and the Apple Watch series, Xiaomi has conquered the low-priced fitness tracking band market by releasing its smartband, dubbed the Mi Band series, at less than the market average price of $50. However, the presence of major makers has made other wearable device makers such as Fitbit and Garmin underdogs in the market. According to Strategy Analytics, Apple topped the market with a 53 percent share in the first quarter, followed by Samsung's 12.8 percent. Fitbit and Garmin had 12.2 percent and 4.3 percent, respectively. Amid such a tough competition, Garmin is seeking to strengthen its ground by providing wearable devices with advanced sports and outdoor activity assistance features. The U.S. wearable maker was established in October 1989 in Kansas by cofounders Gary Burrell and Min Kao. The company has specialized in global positioning system (GPS) technologies and used it for diverse applications from automotive navigation systems to sport assistive devices. "Based on our strengths in GPS technologies, we have held the leading position in the high-performance sport smartwatch market, targeting those who use wearable devices in sports and outdoor activities," a Garmin Korea official said. The company also highlighted that Korea's tech-savvy consumers are its main targets. "There are many early-adopter consumers here and their presence has made Korea one of Garmin's key markets around the world," the official said. "We have learned that Korea also has substantial demand for high-performance wearable devices. To meet such demand, we have been pushing active marketing strategies for flagship devices." Garmin Korea said it is mainly providing wearable devices made for running, cycling and golf as well as multi-purpose flagship sports smartwatches such as the Fenix 5 series. The U.S. wearable device maker opened the Korean subsidiary this March to boost its presence here and to expand its user base to wider age brackets by combining its technologies in fitness tracking and new designs. Garmin Korea head Daniel Chien showed confidence in the competition with major smartwatch makers such as Samsung and LG in the Korean market. "We understand there are a lot of local brands and competition in Korea. But the main difference with LG and Samsung is that they treat smartwatches as accessory of smartphones. But our products not only focus on connectivity but also standalone," Chien said. "We also focus on professional users and provide the new technology and knowledge for them to have better and quicker progress. The competition is always there and we continuously invest in research and development for new product and new technology development." Chien also said the company seeks to provide products that can be accepted not just for sport uses but also for daily lives of all consumers. "Garmin is one of the pioneers to produce wearable devices and has generated a lot of know-how, such as better life and waterproofing," Chien said. "Also, our wearable devices are not only for sports, but can also be used for daily life as well as wellness in life. Our products are not limited to a specific group or person, but for any kind of age and use." 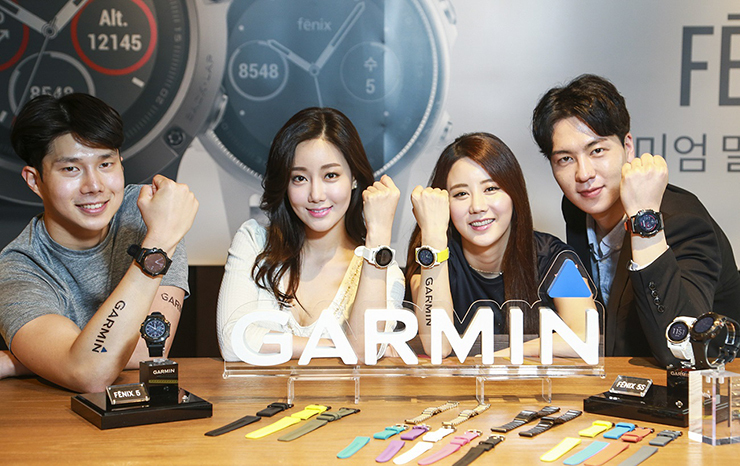 Garmin Korea opened its offline brand shop at the Dongdaemun Design Plaza (DDP) earlier this month. It is the first time for a foreign smartwatch brand to open an exclusive brand store in Seoul, according to the company. "The DDP brand shop will help our potential customers here experience our smartwatches with differentiated sport activity features," Chien said. "Korean consumers have high standards. We plan to continue to invest in this market, aiming at expanding our market base and boost consumer satisfaction." Fitbit was established by Eric Friedman and Korean entrepreneur James Park in 2007. The San Francisco-based company has concentrated on providing devices that measure biometric data such as the number of steps walked, steps climbed, heart rate and quality of sleep. The company has long dominated the fitness tracking wearable device market. But it lost its leadership to Xiaomi, which has provided cheaper devices. According to Strategy Analytics, Fitbit settled at the second spot in the wearable device market with a 15.7 percent share in the second quarter, down 12.8 percentage points from a year ago, following Xiaomi with 17.1 percent. Still, Fitbit said its products are differentiated from others with because of its long-accumulated software technologies that help users assess their physical condition and plan to improve their health. 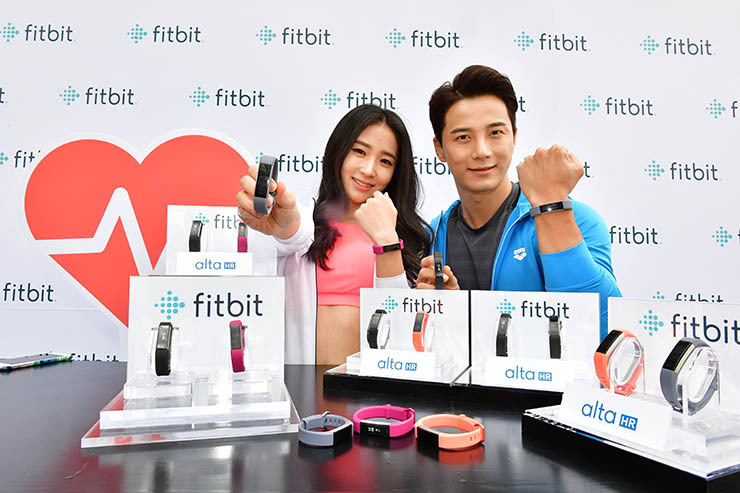 "Fitbit differentiates ourselves in that we are a global brand that is well recognized, trusted and strongly associated with health and fitness," a Fitbit official said. "Our platform combines connected health and fitness devices with software and services to help people become more active, exercise more, sleep better, eat smarter and manage their weight." Fitbit also highlighted that it has a network community which serves as an advantage and makes it difficult for competitors to achieve critical mass. "We had 16.9 million active users as of end of 2015 and we noted that of the 18 million new registered device users added in 2015, 72 percent were still active users at year end," the official said. "Another focus for us has been to increase the density of our social graph as measured by the average number of friends. This metric climbed 53 percent in 2015, to 7.5 from 4.9 at the end of 2014." In an effort to diversify its portfolio, Fitbit recently acquired smartwatch maker Pebble and unveiled its new smartwatch, named Ionic, during Europe's largest electronics fair IFA 2017 this month. Based on GPS technologies, the new smartwatch is compatible with all mobile operating systems including Google Android and Apple iOS. The device also supports mobile instant payment service called Fitbit Pay and a personal fitness training program Fitbit Coach. It is expected to compete with new smartwatches such as Apple Watch 3 in the market at the end of this year.